I’m the kind of woman who needs new goals. They can be small ones like getting my kids to put away their dirty dishes to big ones like maintaining my weight loss. I thrive on new challenges, especially when it comes to running. From new places to run to different types of races, I’m always searching for the next big thing to keep me motivated and inspired. This past Sunday I tried a new type of race and it was just what I needed to keep me going on my weight loss journey. Not my best time for a 5K, but for my first trail run, I’ll take it! 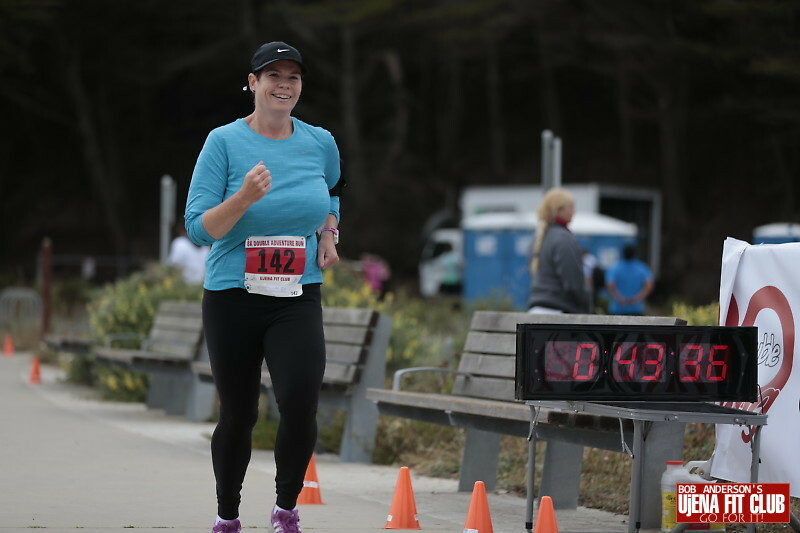 Running is one of the best things to come out of my gastric sleeve surgery journey! A few months ago, I received an email about the Double Adventure Run. It’s an 8K race, but split into two parts. First you run a 5K, take about an hour break and then run a 3K. This one took place at Land’s End which is full of trails by the Pacific Ocean with incredible views including my beloved Golden Gate Bridge. I knew this distance was doable as I’ve done a bit of trail running and I did a 10K in April. This seemed like the perfect challenge, especially when my 11-year-old son, Jack, asked to join me. Jack and I arrived early at Land’s End on race day. If you’ve ever participated in a running event, you know about the energy in the air. This was a small race of less than 200 runners, but it was still exciting. I’ve found many runners to be very friendly and encouraging, especially when you have a child with you. We chatted with other runners and took our pre-race photos in this scenic locale. 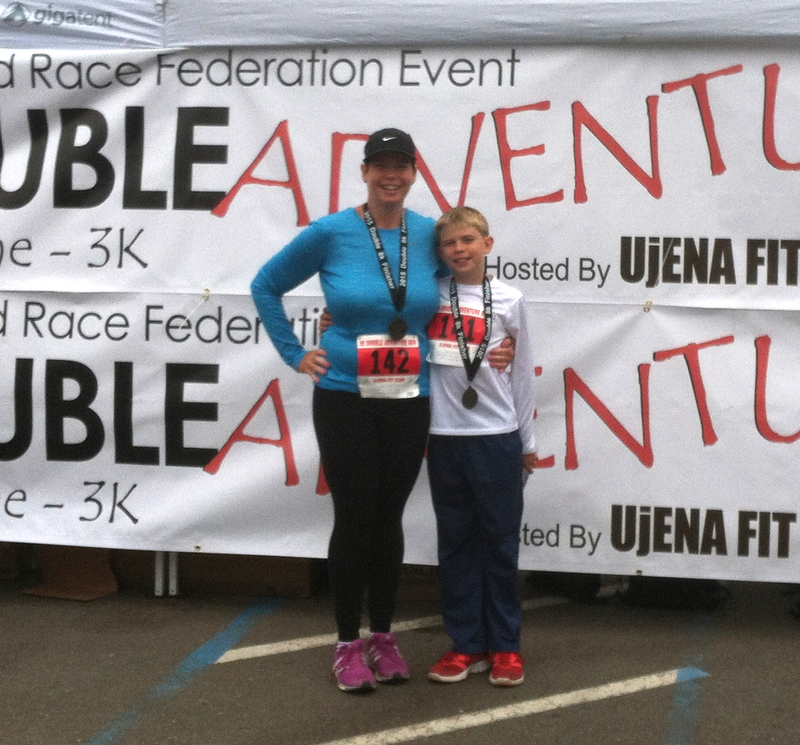 I’d love to say we ran the race together, but I can’t keep up with my athletic son. Jack tried to go to the front of the starting line, but I made him go to the back with me. Pacing is not in his vocabulary just yet, so I knew he would start trying to keep up with the master runners. As a soccer player, he’s used to sprinting and I have to remind him that 5K races are a different type of running. This wasn’t his first 5K, but he did the first one with a friend so they paced each other. My obliging son did start the race with me. We were only about a quarter of a mile in when he batted those big blue/gray eyes at me and politely asked if he could go ahead. I wasn’t finished saying “OK” before he grinned and went running ahead. As much as I wanted him to run with me, I knew I had to let him go. He knew to stay on the race path and wait for me at the end. Part of me hoped I would catch up to him, but I was doubtful. And my doubts were correct when I came to the first 100 step staircase. I knew I wouldn’t see Jack until the end as I huffed and puffed up the stairs. The 5K race started nicely downhill and then up a relatively easy incline, but this beautiful park is full of evil, killer stairs. I’ve walked and run a bit through Land’s End before, but when you’re in race mode it’s three times as hard. Fortunately the other runners around me seemed to feel the same way. There was a feeling of struggle and determination in the air along with a lot of heavy breathing. This mixed with the salt air and sweat made this race unique to say the least. After this first staircase I realized I wouldn’t be able to have a PR (personal record) for this 5K part of the race. I begrudgingly told myself this was OK. This was my first real trail race with hills and staircases. This 5K would be the new baseline for trail races I decided so I pushed through to the end. 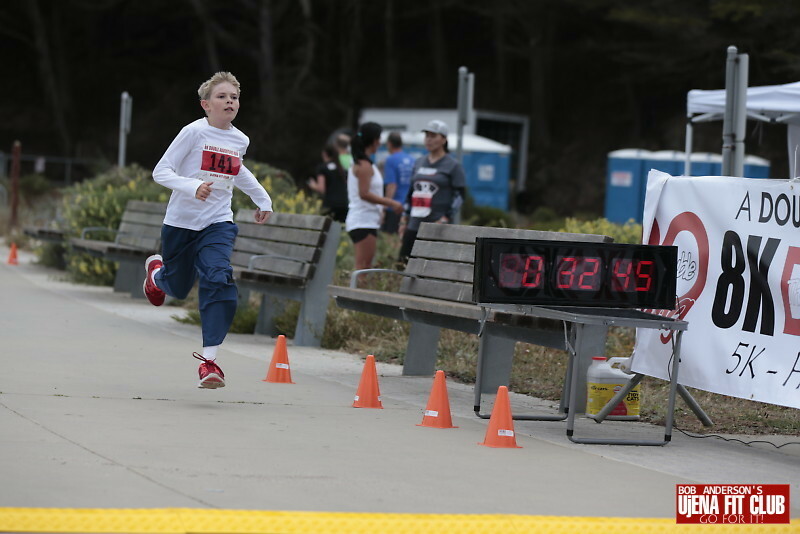 Here is my amazing son running to finish the 5K part of our 8K race. He inspires and motivates me with his athletic abilities! Running to the finish line, I finally saw Jack. Nothing made me happier than seeing his smiling face! He finished 11 ½ minutes before me and I was proud for both of us. Jack said he chatted with other runners throughout the race and one particular runner recommended he try to pace himself. He said he tried to after she talked with him. I just smiled at him instead of saying “I told you so!” Sometimes being a parent means keeping your mouth shut. We weren’t done yet! It was halftime, so to speak. We had about an hour to rest, stretch, hydrate and dance to “Shake it Off” about 10 times before the 3K race. I really enjoyed this time to hang out with my son. We talked with other runners, many of whom congratulated Jack. I love races that have such a positive spirit. While it is a competition I’ve found everyone to be encouraging to each other. I must admit it was hard to get pumped up for the second race even though it was only a 3K. (OK, I never thought I would say “just a 3K” ever in my life!). It’s a bit strange to think about racing again after a break, but once we start lining up, the race energy got me going. As before, Jack went off on his own. This is the time I wished I brought my headphones. I didn’t plan to run with music like I normally do since I would be with Jack. Silly mommy, thinking her baby would run with her! I can’t say I completely enjoyed running without music, but it was a good experience. It was such a beautiful place to run that I really took in the views as I ran. I’m sure it was a safer way to run through the narrow dirt paths and up the steep stairs too. But sometimes when you’re slowing down, having the Foo Fighters sing loudly in your ears motivates you to pick up the pace. While I didn’t particularly run a fast pace during the 3K, I finished with a smile on my face and received a big hug from Jack. I need to start bribing my husband and daughter to come to these races just so I have them waiting for me at the end. Nothing is better than having the people you love waiting for you to complete another challenge. So my little runner finished with a total combined time of 49:51 and his momma finished with 1:09. Would we do it again? You betcha! Splitting the race into two parts was difficult, but fun. Trail running is such a great change from road races and I plan to do more. Here we are after running our first 8K race! I’m looking forward to sharing more runs with my son! Time flies when you’re healthier! These past two years since my gastric sleeve surgery have been challenging and rewarding in more ways than I imagined. *It’s not always about losing weight. At my two-year check-up with my surgeon, he noted I was down a pound from last year, making it a 98 pound loss since the surgery. 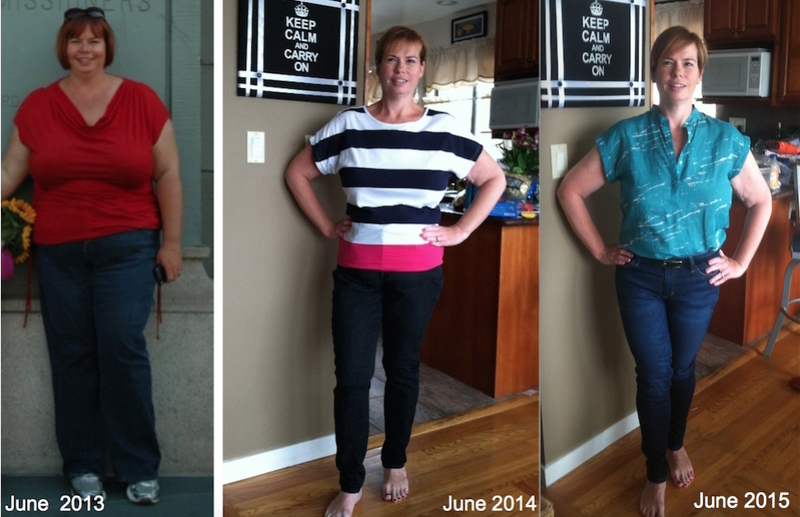 Well, if you’ve read my blog, you know I actually was maintaining a 100+ pound weight loss. I’m struggling with about four to five pounds that keep coming and going. Considering I used to have 20 to 30 pounds I would gain and lose, this is not bad. I am not obsessing about it, but I am working at it. Granted, it’s at a slow pace, but I’m OK with that. *I’ve learned to be more patient with myself. In the past, I would have beaten myself up over the yoyoing weight and changed it to a “F*** it all” attitude. Now I know that straying from my regular healthy lifestyle will happen and it’s not the end of the world, or rather, not the end of my healthy life. It’s as simple as choosing better food for my next meal or going for a run the next day. *Running will always be my go-to stress reliever and the way to maintain my weight loss. After my hernia repair/tummy tuck surgery in September, I was able to run again without pain. It keeps me sane and happy to go out for a run, even if it’s more walking than running. I never thought I would find an athletic activity that I would crave. Some days I’m slow and some days I improve, but every time I run I know I’m doing something important for my physical and mental health. *This is the year to embrace the way my body looks now. Having a tummy tuck did wonders for my physical appearance and my mental health. It put me down a one size smaller and I’m much more comfortable in a bathing suit. But (there’s always a but), I still have wrinkly thighs, flabby arms and oversized breasts. Sure if I wanted to spend the time and money, surgery would fix it all. Also, if I ever commit to strength training, I would have a better looking body. Maybe one day I’ll choose surgery and/or strength training, but for now I’m accepting my body as is. It’s time to embrace me as I am and not shy away from shorts and sleeveless tops. I’ll never go as far as embracing a bikini, but I’m going to wear those sleeveless dresses and shirts I’ve always been afraid to wear. It’s about time! Here I am embracing a sleeveless dress! Something I wouldn’t have done before my weight loss journey. I’ve learned all this and more over the past two years, but the best conclusion I’ve reached on this anniversary is that I truly am a success. Perhaps that sounds cocky or conceited, but I don’t care! I am proud of the person I’ve become. I always thought of myself as the “fat chick” with no hope of changing. My gastric sleeve surgery was just the beginning of this incredible journey to find out who I could be. I just don’t mean a thinner person. I discovered I was tougher, smarter and more confident than I thought. I’m not perfect and neither is my weight loss story. I struggle. I feel defeated. I feel unsure of myself. But I am not giving up…ever. It’s taken me years to believe in myself. Now I have a lifetime to live my life with a positive and confident mindset. Two years down and a lifetime to enjoy going Down the Scale..